PamKittyMorning: Quilt Fun Sew Along! Good morning!!! How was your weekend? Nice sunny weekend here! We're closing in on Christmas right? I hope you're not in crisis mode! 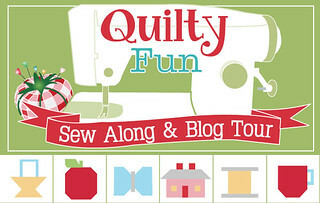 Enough of that kind of talk, it's The Quilty Fun Sew Along and Blog Tour day and it's my stop!!! Makes sense right? For Lori these are cocoa cups, but for me, of course they're coffee cups! You can find instructions for the cups on page twenty eight of Quilty Fun. 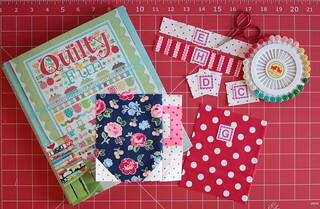 You can head over here and get the cutting instructions for our two sew along cup blocks. I love Lori's big cups.. that's how I like my cups of coffee, the bigger the better! She has a very clever way of constructing those handles.. well she has lots of clever ways for assembly and you can find them in the Quilty Fun book! Are you sewing along? You know you can win some excellent prizes like this stiletto. If you've never tried using one, you can see one Lori's fun video tutorials about it here. There's also a seam ripper, and I think we're all familiar with those! 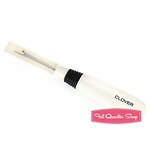 What I like about the Clover seam ripper is the thin sharp blade, it can slide under those small stitches making unsewing less painful! Last but certainly not least is Alphabitties! They sure make piecing those parts together much easier! How do you enter? Upload your completed cute cups to the Quilty Fun Sew Along Flickr page and cross your fingers! Hi Miss Pam…thanks sew much for hosting this week! You are such a sweetie pie and I love your cups of coffee…especially love the navy floral from your picnic…it's perfect!!! Oh Pam you're such a card. Love your post. I enjoy starting my day with you. Your cup is adorable!! Coffee for me too!! Yikes, I am already behind on the Fun along! I need to drink a cup and catch up! So cute! Hummm, the Google monster ate my first comment. The red cup is perfect! I had to restrain myself from copying it! I managed to get three cups done today without using my seam ripper - that's surely a first!